Jeffrey Bossert Clark is as comfortable in the courtroom as he is behind his desk at Justice Department headquarters. The longtime litigator recently took the helm of DOJ's environment team, leading some 600 attorneys and staff who enforce the nation's anti-pollution laws. But rather than being swallowed by the heavy management demands of the Environment and Natural Resources Division, Clark likes to jump in the trenches and argue cases himself. Two weeks ago, he stood before the U.S. Court of Appeals for the District of Columbia Circuit to defend the Trump administration's decision to scrap an Obama-era plan for stricter hardrock mining cleanup standards. Clark worked to fend off environmentalists' claims that EPA's retreat from the proposal violated the federal Superfund law. Then he carefully navigated a minefield of questions from judges wanting answers for the agency's decades of inaction on a key provision of the law. And he did it all on a bum foot, which he fractured in November and had surgery on earlier this year. "Well, it's the only argument I've ever done on a broken foot, so hopefully, it'll be the last argument I ever do on a broken foot," Clark recalled during an interview last week. "But it wasn't so bad." 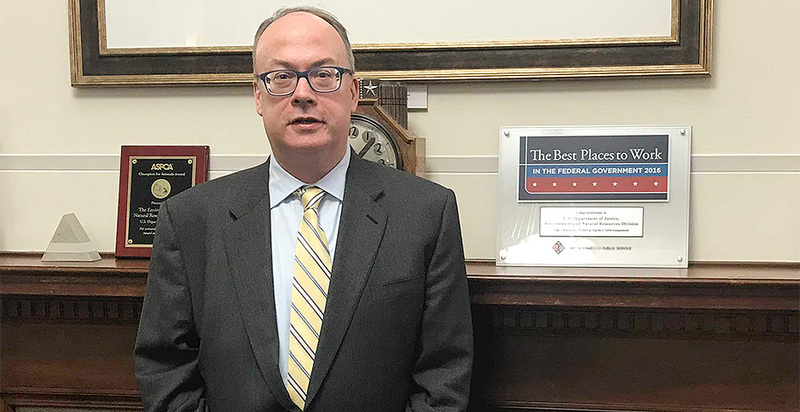 The new assistant attorney general has been on the job just a few months since securing Senate approval in October, more than a year after his June 2017 nomination. He also worked as a high-ranking official in the division during the George W. Bush administration. In June, Clark will head back into the courtroom to argue the high-profile appeal in the so-called kids' climate case in Portland, Ore. He considers his hands-on style — and that of Trump-appointed deputies Eric Grant and Jonathan Brightbill — an important feature of his leadership at DOJ's environment division. Asked about his top priorities for the team, Clark is quick to answer: defending President Trump's agenda. That includes litigation on regulatory rollbacks, environmental enforcement and efforts to secure land for a wall along the U.S. border with Mexico. Environmentalists battled Clark's appointment, pointing to the former Kirkland & Ellis LLP lawyer's work representing BP PLC after the Deepwater Horizon oil spill and his public criticism of the Obama administration's landmark legal finding that greenhouse gases endanger public health. Clark brushes off his detractors: "They don't necessarily have a very developed sense of how the Justice Department works." And he's eager to focus on his biggest accomplishments so far, which include reaching a major federal settlement worth more than $500 million with Fiat Chrysler Automobiles for alleged cheating on auto emissions tests. Clark sat down with E&E News last week to discuss his leadership style, the Trump administration's litigation record and his views on the endangerment finding. You had such a long confirmation process. What was that like being in limbo for so long? There was some frustration in it, obviously, but you can't dwell on the rear view. What's in the past is in the past. ... I was fully employed, so it wasn't like I was kind of sitting around just waiting, which would have made it more frustrating. It wasn't an optimal experience, but it's done. It's good to be here. I enjoyed my time here before, and it's been great to get back to it. How have things changed between now and your first go-around at the division [from 2001 to 2005]? I was the deputy who had the Appellate Section and the Indian Resources Section, so I did not do a lot of management activities. I focused more on the legal issues that the division faced in those two areas. For the appellate stuff, that means virtually everything the division is doing. There is still exactly that deputy position as one of my deputies, so that really hasn't changed at all. And a lot of the personnel in the Appellate Section are exactly the same: same section chief in Appellate as there was before, two out of three of the same assistant-level chiefs. Then in the Indian Resources Section, same chief. There's a lot of continuity here because of this being one of the best places in the federal government to work. People come, and a lot of them stay for their whole careers. I've been authorizing redwood plaques for people [to recognize distinguished employees], and so they tend to go to people that have been here a long time — three decades, four decades. It's really amazing. There's a lot of continuity. Do you have a good relationship with the career staff? I think so, yeah. I think different people have different styles, and so my style is to be focused on being hands-on and being an active litigator still, which is one reason why you saw me do that argument [at the D.C. Circuit]. I'm going to do other arguments. I get into the guts of briefs — from things small, like missing quotation marks, to things medium and large — I edit things up. I'm not just in a pure managerial mode, and that's the way I like it. It's one reason why, in terms of other things that you could do in the federal government in a new administration, I was particularly interested in coming back to the Justice Department. What are your big priorities for the division? The biggest one is defending the administration's agenda in the courts. There are a lot of new rulemakings that are slated to come out, and so participating in those and preparing for the legal challenges to those. Then, of course, continued active enforcement. You were here for the Fiat Chrysler announcement, right, which garnered more than a half-billion dollars of recovery for the United States, in one form or another? I mean, that's huge. I think that there might be other cases like that — not talking about any specifics — that are on the horizon. We've had cases in a number of different areas that have been very successful in the enforcement realm. On some of them, they're really novel or they're record-breaking in terms of what they're accomplishing. Those are the main two areas. There's a lot of work that goes on behind the scenes with the agencies on these things, because they're just incredibly complex. So sometimes I have to interface with other parts of the department. Sometimes they're not used to the level of complexity of some of the things we do. It can be mind-boggling. But if you've spent a lot of time working on cases like this, they become second nature. The budget proposal included a boost for the environment section on border wall issues. Is that a big part of your portfolio? So we're working jointly with the Civil Division on that. There are environmental challenges to the border wall going on. But there are defenses to that that go to waivers and a statute called [the Illegal Immigration Reform and Immigrant Responsibility Act]. So it's natural for the Civil Division to have the lead on those, because they primarily involve areas that are in their internal delegation, but we're working with them jointly on it. And as to acquisition projects for land that relate to putting the border wall up, we're the part of the federal government that is the central housing of the machinery to exercise the power of eminent domain, so we're working on it from that standpoint, too. I think we're up to a half-dozen lawsuits at this point. Some of them involve environmental claims; many of them don't. Some of them involve states or general organizations making challenges, some of them in far-flung places, as opposed to the courts where the geography of the wall is. The issue there is that not all of the cases involve particular acquisition projects or landowners who fear their particular parcels might be taken. There's a lot of general challenges based on the idea that the president needed Congress' authorization to specifically use the money for that purpose. What made you decide to argue Juliana v. United States, the high-stakes kids' climate case at the 9th U.S. Circuit Court of Appeals? It is high-profile, and it's important to the law and to the administration because clearly it was an important case in the prior administration. It was filed in the last administration; it wasn't filed in this administration. I don't want to get into any real details about it because of the fact that it's pending, but what I will say to you, and you can read our briefs, look at the injunction pending appeal relief that was sought by them, right? [The motion seeks to block federal permitting for fossil fuel development.] It's incredibly broad. You don't run across a lot of cases where someone is asking for that much relief, where they have sued as many Cabinet agencies as they've sued, so that's a highly unusual case. It's an obvious candidate to be taken on at a higher level. ... I like to get in and get my hands dirty. And that's just a style preference depending on who's in your seat, right? Some other division chiefs didn't go to court very often. That's right. It is a style thing. It depends on what skill set you have. Some people have intense management backgrounds, and they're poring over spreadsheets. Which is not to say I'm not looking at spreadsheets, too; it's part of the job. But I'm more inclined to be poring over what the third Roman numeral in a red [response] brief to be filed in the Court of Appeals is saying. The Environment and Natural Resources Division informed staff last year about plans to close the division's office in San Francisco. Any updates on those plans? I'm looking at the data about that and then trying to process that. There was obviously a lot of work done on that before I arrived. I can't say it's reached any kind of final conclusion. What's clear is that if the office did need to move, because obviously San Francisco is a very expensive place to have an office, is that any employees ... we would help them with their relocation expenses, whether it's to Denver or D.C., if they wanted to stay within the ENRD family. Part of your role involves policy priorities that are unique to the Trump administration, but in many other areas, you're picking up where your Obama-era predecessors left off. How do you respond to your critics in the environmental community who were so concerned about your influence on both areas? They don't necessarily have a very developed sense of how the Justice Department works. When I got here in 2001, a lot of what I was doing for the first six months to a year ... was defend Clinton administration decisions, which the Bush administration had decided to leave in place. For any administration, when they change from one party to the other, things fall into the category of things that they move quickly to reverse, things that they quickly determine were decided correctly, and then a sort of middle zone where they think about: Is this something that it makes sense to change? Or, on balance, even though we wouldn't have done it this way, shouldn't be changed? I think that maybe the environmental groups who did launch some criticisms like that didn't understand the role of an advocate and the institutional nature of the Justice Department. It's not like everything can change on a dime — or that I'd either want everything to change on a dime, that I could make everything change on a dime. In any event, for the vast majority of cases, I'm not the decisionmaker. The agencies and the policymakers at those agencies are making the decisions, and then the issue is, I will defend them as long as they're consistent with the Constitution and statutes and don't otherwise pose any issues of illegality. Have your views changed on the endangerment finding for greenhouse gases? As far as I know, EPA is not looking again at that issue, but I certainly wouldn't want to tie their hands if they did decide to look at the issue, so I would decline that question for the same reason that I declined it at the confirmation hearing, which is that my personal views on that are not relevant to my job. What the agency decides to do will drive what litigation positions we would take — again, as long as it's consistent with the law. I don't want to make it sound like we're just a sort of reflexive mirror of what they do. Behind the scenes, there are, believe it or not, sometimes there are proposals made that have legal problems, so one needs to explain what the legal constraints are to the policy people. But if they do make a decision and it is consistent with law, even if it might not have been the decision that I would have made, my duty is to defend it. A lot of the Trump administration's early legal defeats on regulatory issues were before your time. Do you anticipate a better record for the next round of regulatory decisions as they're defended in the courtroom? I'd like to hope that my involvement can help improve the quality of the defense, but at the end of the day, here at the Justice Department, we are advocates, and it's the Article III judges who make the decisions. So you can do the best possible job, and if the judges disagree with you, then as every litigator knows, you're going to have your fair share of losses. So I can't tell you exactly which ones we're going to win and which ones we're going to lose. But I can tell you that we have a special focus on trying to win as many as we can and that that consumes a lot of hours of my day, and I'm committed to improving the record in that department.